This is the Guest Folio screen. This is where you check in a guest, enter information about the guests and their stays. This also is where you make changes such as room assignment and departure date (days stay). You can get to this screen from several places. Use the one that is fastest or most convenient for you. From the Display Folio icon, enter the room number or look up the guest by name. When the folio displays, select "Change folio". From the Tape Chart (Rooms Availability) right-click a green square showing this guest. Select Display Folio. From the People/Profile icon, enter the guest name to find the guest. Select the guest and click "View Guest Stays". Click the line for the in-house stay and select "Display Folio". From the People/Profile icon, click "View all in house". Click the desired guest. Click "Display Folio". From the Front Desk Operations menu, select "Change guest information". 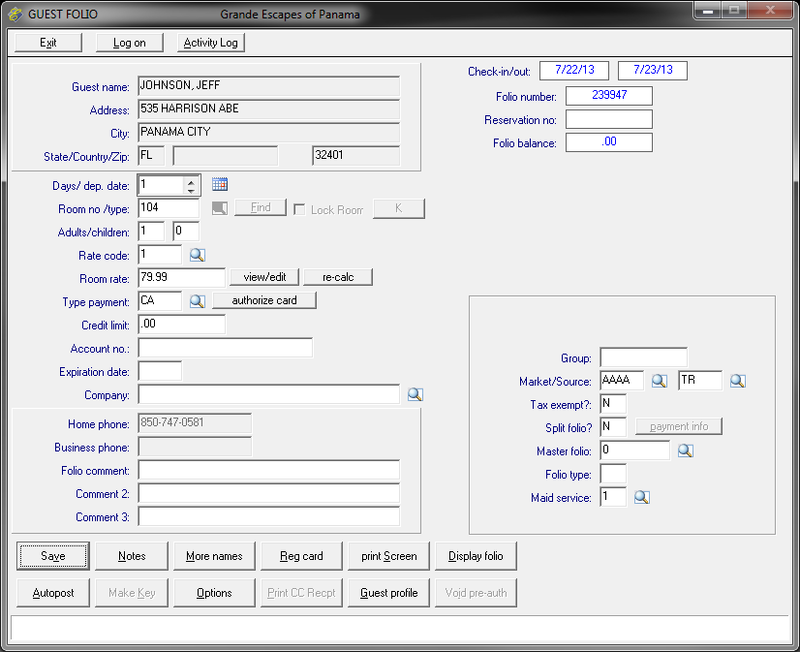 You can click "Display folio" to view charges and payments posted to this folio. From there you can click "Post" to post new transactions. To check out a guest and/or post final payments go to Check Out from the toolbar or the Front Desk Operations menu. Remember to save your changes before exiting.